When you contact our firm regarding a traffic matter, we know that your traffic case is very important to you. Some attorneys might not seem to care about your case, or put it on the back burner while they focus on cases they consder “more important”. At The Curtis Sluder Law Firm, we care. When our attorneys are working on your case, we consider that case to be as important as any case we handle. Because we know it is to you. That one “simple” ticket could mean your insurance rates will skyrocket, and disrupt the tight budget so many of us find ourselves on. That one “simple” ticket could be the one that costs you your license, your job, your way of life. No case we accept is treated as if it is “minor” or unimportant. We strive to provide the best possible representation with every case, and consider the person, the facts, and the financial and legal impact behind each case. TRAFFIC TICKETS- CLICK HERE TO GET STARTED! At the Curtis Sluder Law Firm, Criminal Law, Traffic Law, and Impaired Driving Law is what we do. Period. We have built our practice around ONE area of law, and not a hodge-podge of legal specialties. We are attorneys practicing Traffic and Criminal law in Western North Carolina, in court, on a daily basis. If you have received a traffic ticket or citation in one of the 9 Western North Carolina Counties in which I practice (Burke, McDowell, Madison, Buncombe, Henderson, Polk, Transylvania, Haywood, Or Jackson) we would like to help you with that ticket, protect your license, protect your good insurance rates, and save you time, money, and stress. I am Curtis Sluder, and I grew up in this area, and have built the largest criminal and traffic practice in Western North Carolina. My Associate, Vijay Nathan, was an assistant District Attorney in McDowell County prior to joining my office. Together, we have represented drivers from all 50 states and several foreign countries. Since I started my law practice in 1998, over twenty thousand motorists have used my services; I have saved drivers hundreds of thousands of insurance dollars, year after year. On a regular basis, Judges, Prosecutors, and other attorneys ask me questions about traffic law. I have presented continuing education classes to other attorneys on the subject of traffic law and saving license points and insurance costs. I have extensive experience and knowledge of traffic law and driver license issues, and I hope you will let me put my experience, knowledge, and dedication to work for you. I know that when I have had a problem of concern to me, and any matter affecting my privilege to drive is important to me, I have felt better about the situation once I understood exactly what my options were, what the likely results of each option were, and what steps I need to take to make my situation better. I will do this for you. Having the experience that I have, along with special knowledge of how things are done in multiple counties, my base of knowledge in the areas I practice is quite thorough. On a daily basis, other attorneys call me and ask advice for their own clients. I have presented material to other attorneys at Continuing Legal Education Seminars, first with the NC Academy for Justice, at an Asheville, NC Seminar, and we are currently planning a new Continuing Education Seminar with legal updates and changes in NC Law. I have been routinely approached by Judges and District Attorneys to offer experienced advice in my cases, and in the cases of other attorneys and individuals. I work closely with the Elected District Attorneys as well as the assistants in each county. Why do other Attorneys, Judges, District Attorneys, and even law enforcement officers come to me with their questions? I suppose it is because they know that no attorneys in this part of the state has more real, practical experience in this area of law than we do. Our attorneys are in court every day fighting for our clients. We work hard to keep up with new cases, new laws. We study, research, and lobby our legislature for changes in North Carolina Law. And, I suppose, people find our attorneys approachable, and easy to talk to. Our staff is the same way- we strive to be pleasant, easy to talk to, and informative. We look forward to your call or e-mail. With each client I undertake to represent, I begin with the basic information: The charge, the county, the basic facts. I then inquire about the drivers record, state, and license type. I go over each citation looking for a way to beat the charge, if possible. I look for ways to get the charge dismissed or things that might result in the driver being found “not guilty”. If the odds are against us, or I cannot fond a way to get the charges dismissed, I then negotiate with the District Attorney for a resolution that will have no impact, or the least possible impact, on my clients license and insurance. There are always several possible options, and I try to explain these options to each client when they call- so my client will know in advance what I will be pursuing. If some unexpected circumstance arises, I ask to continue the case so I can discuss these things with my client and re-evaluate how we want to proceed. And in the vast majority of traffic cases, the client never has to go to court. Let us deal with the hassle, stress, and time away for you, so you can go about your life with one less thing to worry about. Can past mistakes be undone? Traffic tickets cost far more than just the expense of the citation itself. Automobile insurance rates increase based on your driving record. Traffic tickets cost far more than just the expense of the citation itself. Automobile insurance rates increase based on your driving record. A conviction for a moving violation results in two types of costs, and two kinds of points. The first set of points are “license points” These are tracked by the department of motor vehicles. 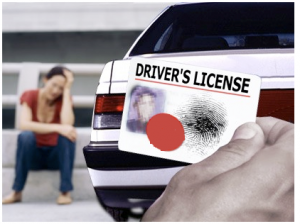 Each driver is allowed to acccumulate a certain number of points before their license is revoked. Some states simply do this in reverse- giving each driver a certain number of points, and deducting points for each violation. 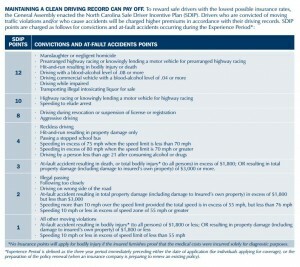 These points are important, in that when you accumulate too many, you risk losing your privilege to drive. It is a good idea to always be aware of how many points you have on your license. There are certain points when some drivers may be able to do things to have points removed, and there are certain ways of handling citations that result in fewer license points, or none at all. The second type of points are more important to most drivers- these are “insurance points” North Carolina, like most states, has rules in place that regulate when your insurance company can increase your rate. 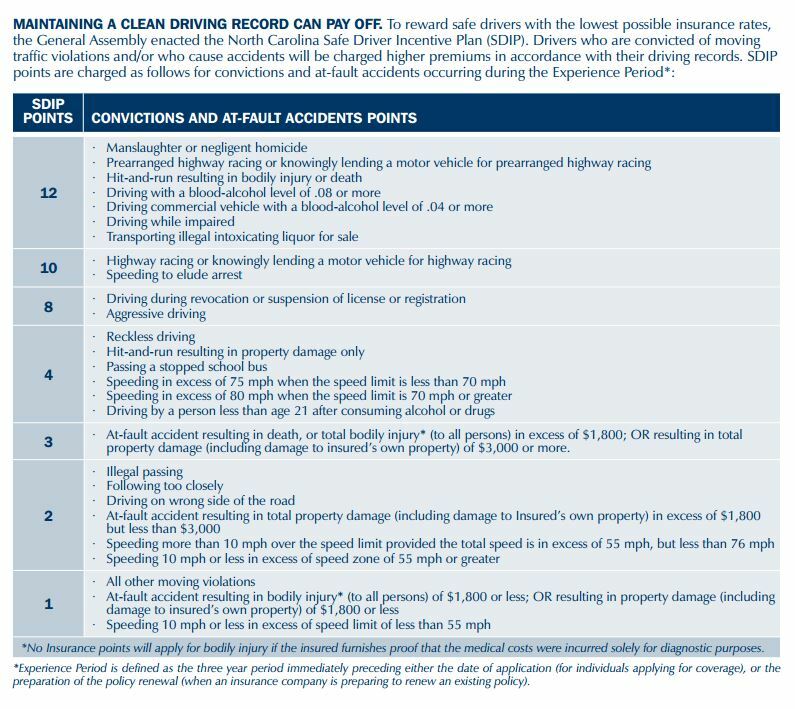 Most moving violations carry a certain number of “insurance points”, and the number of points the driver has controls the rate the insurance company charges. Most people are surprised to learn how much their rates increase with a single violation. The charts below, from the North Carolina Department of Insurance, illustrate the points assessed and the rate increase associated with different point totals. Traffic tickets follow you home. North Carolina is a member state in several interstate compacts. These interstate compacts report traffic ticket information to one another. The citation you receive here will usually find its way to your state, and your permanent record. If you are an out of state driver, please be aware that North Carolina is a member of both the Driver License Compact (DLC) and the Non-Resident Violators Compact (NRVC). These are agreements among the states to report traffic violations and suspensions to each other. We have handled criminal and traffic matters for drivers from all 50 states (and several foreign countries!) and we will put our experience to work for you. The key with out of state violations is understanding what North Carolina will report to the interstate database. We work to carefully guard what is entered as a conviction. Out of state tickets received by North Carolina drivers can also impact your NC driving record, via these interstate compacts. If you are a North Carolina driver, and you have been cited out of state, we can often suggest ways to look for a competent attorney in another state. 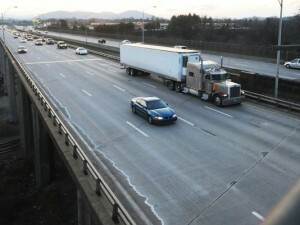 NC Convictions follow drivers home. We work with numerous trucking companies and legal insurance companies who focus on CDL drivers. We understand that your license in your state is not the only concern- CSA (Federal) points are also a serious issue for commercial drivers. We regularly represent commercial drivers on CDL specific charges, such as Lane Violations, Federal Inspection Violations, grade restriction violations, overweight violations, and log book violations. We also fight for truckers against North Carolina’s harsh alcohol and drug laws, argue against suspensions and commercial disqualifications, and use every weapon in our extensive arsenal to keep you (and America) working. Any violations while driving will come with higher penalties and increased severity. Moving violations on a CDL in North Carolina are a serious situation; many employers of those with CDLs have a zero tolerance policy for such charges, and a single violation may result in the loss of a job. More than one violation may also lead to the suspension or total removal of the CDL. If a CDL driver is convicted of actions in his or her personal vehicle that result in the suspension of a license, he will also have his CDL suspended. Many drivers make the mistake of assuming that citations received in a regular vehicle, or those received while “off the clock,” will not be a problem. The opposite is true, not only in North Carolina but across the US. Professional drivers are expected to use their skills at all times, and careless, reckless or otherwise citation-worthy actions taken by a driver will impact his CDL status, regardless of whether he or she was in a commercial vehicle at the time. It’s also important to note that a driver with a North Carolina CDL who receives a violation in another state, whether as a commercial driver or on his personal record, will be subject to penalties back in North Carolina. The fact that a violation occurred in another state is no barrier to the driver being penalized by North Carolina in the same way as if the offense had occurred there, up to and including the suspension of the license. North Carolina has enhanced penalties for traffic offenses committed in a commercial vehicle, and we are experienced and knowledgeable of how these traffic laws specifically impact CDL holders. NC law can be very harsh when it comes to otherwise minor traffic matters. There are over 70 ways to lose your privilege to drive in this state. Please do not assume that your minor ticket will not have serious consequences. Driving After Consuming alcohol OR DRUGS < 21 y.o. Driving after Judge ordered non-operation of MV as part of suspended sentence. Dropping out of high school < 18 y.o. License revocation for any reason in any other state. Involvement in MV accident with No. Ins. Occasionally, we speak with drivers who have made recent mistakes in dealing with traffic matters themselves, or with less than effective attorneys, and have discovered their insurance rates have skyrocketed. Sometimes, the problem is worse- they get a letter of revocation from the Department of Motor Vehicles. If you have a case that was improperly handled by an attorney, or if you handled the matter yourself and did not understand just what you were doing, call us- It may not be too late to correct mistakes and save your good record. You can call us for a free consultation about your situation, and get back on the right path. If you paid your citation online, and wish you had not- call us, we may still be able to help you in some situations.